Welcome to another week of NFL football. 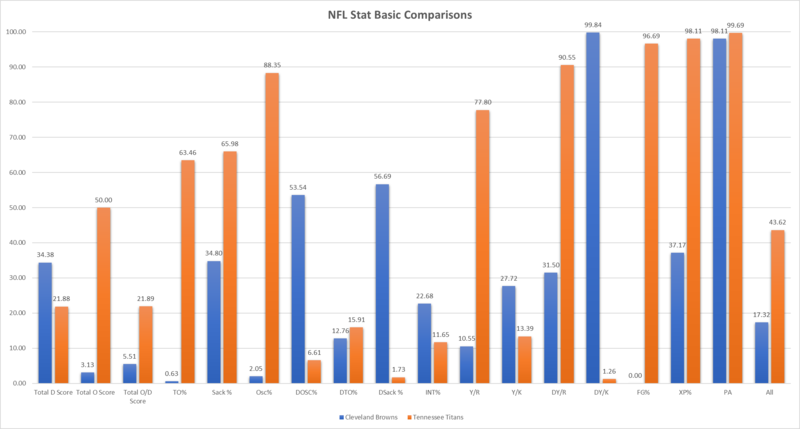 Now let’s get to who the data favors between the Cleveland Browns and Tennessee Titans based on analytics. Overall Data Favors: Tennessee Titans due to offense and special teams. Welcome to NFL Week 5. Now let’s get to who the data favors in the San Francisco 49ers vs. Indianapolis Colts matchup. And if you are new to my work a glossary of terms can be found here. Overall NFL Data Favors: Colts due to defensive strengths. Overall Completion Data Favors: 49ers Defense. Overall Rushing First-Down Conversion Rate Data Favors: 49ers defense except for massive disparity on 3rd Down. Interception Rate Data Favors: 49ers Defense, but there is a decent disparity on 2nd Down favoring Colts. Overall Impression: The data favors the Colts, but there is not a massive difference between these two teams. This is a winnable game for the 49ers. However, the Colts’ defense has shown to be at least average. And the ability to create interceptions that can change the tide of games is high for the Colts as well. Thus I’d side with a victory for the Colts. Hello and welcome to another fine week of NFL football with a preview of the Cincinnati Bengals vs. Cleveland Browns game based on analytics. If you are new to my work, the link to a glossary of terms is here. 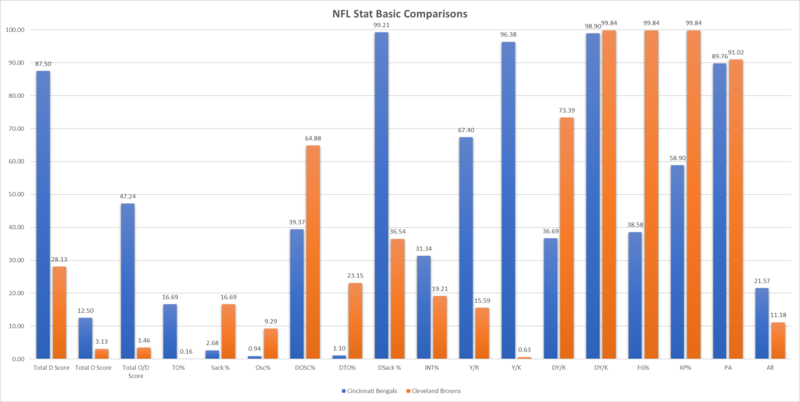 Overall Data Favors: Bengals due to defense advantages. Overall Completion Data Favors: Bengals over Browns D except for 3rd Down situations. Overall Completion Data Favors: Bengals over Browns offense. Rushing 1st Down Conversion Data Favors: Browns over Bengals offense. Rushing 1st Down Conversion Data Favors: Browns over Bengals defense except for 3rd Down situations. Passing 1st Down Conversion Data Favors: Bengals over Browns defense except for 2nd Down situations. Sack Rate on Various Downs Favors: Browns defense except for 2nd Down situations. Sack Rate on Various Downs Favors: Bengals’ defense overwhelmingly. Interception Rate on Various Downs Favors: Bengals offense except for 3rd downs and especially 3rd and long. Interception Rate on Various Downs Favors: Bengals defense overwhelmingly. Total O Score: First-Down Conversion Percentage for all downs compared against all team performances since 1998. TO%: Percentage of turnovers per possession on offense compared to all offenses since 1998. Sack%: Percentage of sacks per possession on offense compared to all offenses since 1998. OSC%: Percentage of drives leading to a offensive score compared to all offenses since 1998. DOSC%: Percentage of drives leading to offensive score compared to all defenses since 1998. DTO%: Percentage of drives leading to a offensive turnover compared to all defenses since 1998. DSack%: Percentage of drives leading to a sack compared to all defenses since 1998. INT%: Percentage of drives leading to a interception compared to all defenses since 1998. FG%: Field Goal percentage compared to all teams since 1998. XP%: Extra point percentage compared to all teams since 1998. PA: Average yards per punt compared to all teams since 1998. 40-49: Field Goal percentage of 40-49 yards compared to all teams since 1998. 50+: Field Goal percentage of 50+ yards compared to all teams since 1998. Y/R: Yards per punt return compared to all offenses since 1998. Y/K: Yards per kick return compared to all offenses since 1998. P/TD%: Touchdowns per punt return compared to all offenses teams since 1998. KTD%: Touchdowns per kick return compared to all offenses since 1998. DY/R: Yards per punt return compared to all defenses since 1998. DY/K: Yards per kick return compared to all defenses since 1998. DP/TD%: Touchdowns per punt return compared to all defenses teams since 1998. DKTD%: Touchdowns per kick return compared to all defenses since 1998. The All-Quarterback mock is a NFL mock draft created entirely of quarterback prospects. The draft selection rankings are based on an extremely confusing and arbitrary set of Pythagorean theorems with heavy emphasis on the illuminati. If you are confused and don’t have a clue about what I just said. Then you are not prepared for this mock. If you think I should just call this a ranking versus a mock, then you are a communist and capitalist cuck who doesn’t deserve an explanation. This is the All-Quarterback mock. That’s right, Make America Dougie Again! And Katy Perry should allow this very short man to score in the paint. I know he’s never played quarterback in his entire football career, but my subconscious. And my very biased fantasy of Lamar Jackson actually doing quarterback things is too rich not to indulge in. There is literally zero film of Jackson doing quarterback things. Thus with no evidence, this is purely speculation here. I apologize for my flights of fancy. It’s time for Eli to go. His offensive line is horrific in a slow descent of madness that is the Giants’ front office. But change is necessary. With a quarterback whose subscapularis muscles must be inflamed every week. The Chosen Rosen removes the Orange Cuck that is Andy Dalton. Drew Brees isn’t getting any more clichéd. Every number says no, but Hue Jackson says yes. Mitch Triscuitby will crunch under pressure allowing some backdoor action with Allen. He’s kind of like Bryce Petty, but better. Maybe. He’s not Ryan Lindley I promise. PAC-12 quarterback with a weak velocity, but can execute the offense. Sound familiar? Decent backup West Coast type. Kyle Sloter is the future, but Thorson can pick up the pieces left by wounded veterans. He’s used to running around with no offensive line help too. He was good in high school. He’s kind of like Johnny Manziel with less of the other stuff. I haven’t watched his film this year, but that isn’t the point of mocks. He’s kind of like E.J. Manuel. Tall and big arm. That’s about it. He’s the guy Carson Wentz’ girlfriend told him not to worry about. I literally just googled “2018 NFL draft quarterbacks” and his name popped up. Lion fans will be familiar with him. Lots of physical tools with little development. The spread version of Trevor Siemian. Running out of wiggle room here. Because they already passed on the greatest quarterback god ever created. The holiest of holies: Patrick Mahomes. I’m running out of options here. Son of Jack Del Rio. Hello and welcome to another season of NFL football. And this year I will have a treat for you in metric matchups. Each week I will breakdown one game from the NFL using analytics to find where the best mismatches are in addition to team strength and weaknesses from a data perspective. This week I decided to focus on the first game of the NFL season in the New England Patriots vs. the Kansas City Chiefs. Here is how things stack up athletically speaking. The Kansas City offense has advantages in terms of skill position athleticism versus the New England secondary. But a key matchup to watch is Bryan Witzmann vs. Alan Branch. Witzman is one of the more unproven and less athletic offensive linemen on the Chiefs. And could potentially be a weakness inside against Branch. Which could disrupt inside runs and speed up Alex Smith’s timing as a passer if pressure comes fast inside. On the New England offense side of things. They will have skill position advantages as well. Where both Cooks and Malcolm Mitchell have mismatch ability against KC’s corners. Offensive line wise, Justin Houston will be a key concern for New England as his athleticism is a mismatch everywhere. And Shaq Mason vs. Allen Bailey will be a interesting matchup too. Taking all the athleticism into account on both sides. 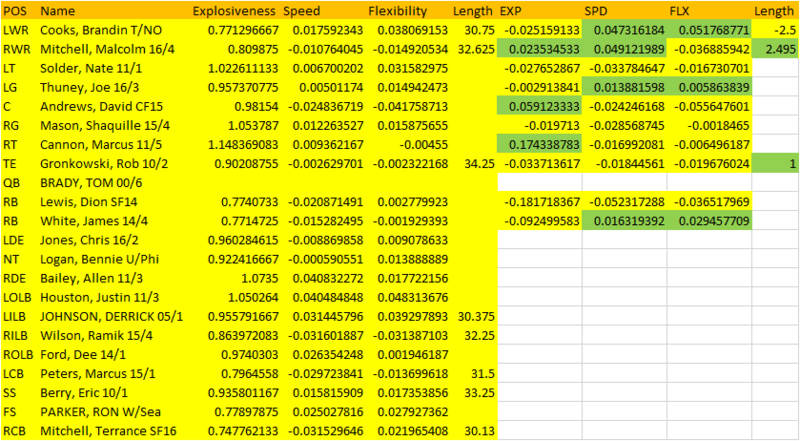 KC will have an explosiveness advantage on offense. 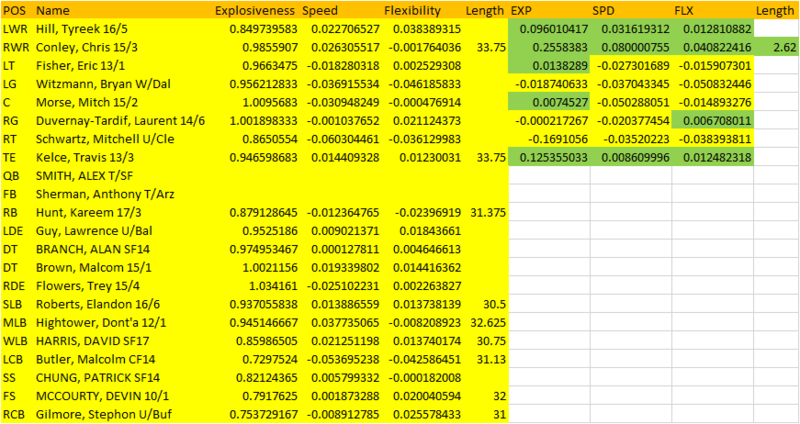 And KC will win in all three athleticism traits on defense overall. Strategy will be key for NE’s offense against KC’s defense. Especially when it comes to the offensive line of NE. Looking at the offensive and defensive split data from 2016. If this game had happened last season: NE’s rushing offense would have had a easier time compared to Kansas City’s rushing offense. And passing offense wise: NE’s passing offense would have had a better overall time against KC’s defense compared to the flip side of things. Looking at the various offensive and defensive split results combined. NE’s offense has a sizable advantage offensively over KC’s defense. With KC’s offense being more evenly matched with NE’s defense. It’s a new season of course, so these variables will change. However, I would still give NE the advantage in this matchup based on the disparity of the data from 2016. We will see how the athletic advantages of KC will affect this game in 2017. But if there ever was a coach who can out strategize a disadvantage it’s Bill Belichick. So I’d roll with the safer pick in NE this Thursday. Metric Matchup Prediction: New England Victory if they continue their level of play from 2016 in 2017.